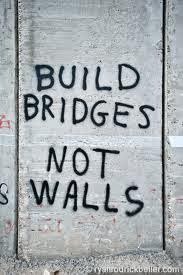 Is your communication building bridges, or walls? Every relationship we have with other people consists of choices and actions: we either work to build bridges to others, sharing in relationship with them and building intimacy, or we put up bricks and barriers that become a wall between us. As followers of Christ, we must realize that other people will invariably disappoint us (because we are fallen human beings and because only God can satisfy our deepest need for relationship), but those disappointments should not stop us from loving others well. The first and second greatest commandments Jesus taught were to love God and to love others. Because Jesus had a perfect relationship with the Father, he could love other people well. The call every day before us is to depend upon God’s Spirit and to love God and to love others well, continuing to build bridges to relationship with them- even when we perceive they have put a brick in the wall between us.